Her age at death per cemetery records was 89, but birth records indicate she was nearer to 93 years old. 1910 census reports that she has borne 3 children and that one of them is living (Henrietta). Per ownership records, the tomb is the final resting place for Cecile Cagnolatti Fauria, Vincent Fauria, Kenneth R. Fauria, Josephine Fauria Barham, Cecilia J. Fauria, Frederick V. Fauria, Olympe Fauria, Edwin J. Fauria, and Henrietta Fauria Dillenkoffer. [S25] Census-US federal-1900, (Ancestry.com. 1900 U.S. Federal Census [database on-line]. Provo, UT: MyFamily.com, Inc., 2004. T623, 1854 rolls. ), New Orleans, Ward 5, Orleans, Louisiana; Roll: ^623 572; Page: 9B; ED 50 (Reliability: 1). [S18] US-Louisiana-Orleans Parish-New Orleans Birth Records Index 1790-1899, (Ancestry.com Provo, UT, USA: The Generations Network, Inc., 2002. Original data: State of Louisiana, Secretary of State, Division of Archives, Records Management, and History. Vital Records Indices. Baton Rouge, LA. ), FLUERY, Olympe; 2 May, 1876; Volume 66, Page 940. (Reliability: 2). [S144] Census-US federal-1930, United States Bureau of the Census, Louisiana, Orleans, New Orleans, Ward 7; Roll 805; Page 10A; ED 113; Image 362.0; Family Number 161 (Reliability: 1). [S75] Obituary Index, New Orleans Public Library, New Orleans Public Library, (New Orleans, Louisiana; New Orleans Public Library; http://obits.gno.lib.la.us/nopl/obitindex.htm), States-Item	1969-10-17	pg 4 col 2; Times-Picayune, 1969-10-17	pg 16 col 5 (Reliability: 1). Calculated from age (54) given in obituary. [S28] Census-US federal-1920, Ancestry.com, (Provo, UT, USA: The Generations Network, Inc., 2005. ), Louisiana, Orleans, New Orleans, Ward 7; ED 120; Sheet 14B; Family Number 310. (Reliability: 1). [S25] Census-US federal-1900, (Ancestry.com. 1900 U.S. Federal Census [database on-line]. Provo, UT: MyFamily.com, Inc., 2004. T623, 1854 rolls. ), New Orleans, Ward 5, Orleans, Louisiana; Roll: T623 572; Page: 9B; ED 50 (Reliability: 3). [S511] US City Directories, 1821-1989 (ancestry.com), (\i Ancestry.com\i0 . http://ancestry.com : 2011), Polk's New Orleans (Louisiana) City Directory, 1940: Page 413 (image 199); <http://ancestry.com : accessed 13 Dec 2014 (Reliability: 3). [S75] Obituary Index, New Orleans Public Library, New Orleans Public Library, (New Orleans, Louisiana; New Orleans Public Library; http://obits.gno.lib.la.us/nopl/obitindex.htm), States-Item, 1969-10-17, pg 4 col 2; Times-Picayune, 1969-10-17, pg 16 col 5 (Reliability: 1). 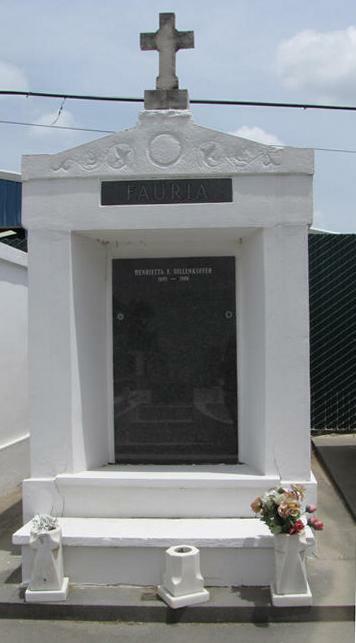 [S334] US-Louisiana-Orleans Parish-New Orleans-St. Louis Cemetery #3 Fauria Tomb ownership records, Saint Louis #3, Fleury, Olympe. Burial 17 Oct 1969, Position V2. (Reliability: 3). Name of Owner(s): Fauria, Heirs of Mrs. Mitchel «i»[sic].«/i» Location: Square 3; Section O; Lot 27; Facing Alley de la Vierge. Type of memorial: S/W CEMENT TOMB; Perpetual Care. Title #350; Date Issued: 5/10/1968. Title Fee: Folio # 137. Title Holder(s) Current Name: Robert Boyham, 212 W. St. James Baptist, Chalmette, LA 70043; Phone 279-1012 (This information received Oct 2009.) Records indicate ten burials dating from 1938 to 1986. [S25] Census-US federal-1900, (Ancestry.com. 1900 U.S. Federal Census [database on-line]. Provo, UT: MyFamily.com, Inc., 2004. T623, 1854 rolls. ), New Orleans, Ward 5, Orleans, Louisiana; Roll: T623 572; Page: 9B; ED 50 (Reliability: 1). [S5] New Orleans Marriage Records Index 1831-1964, (Ancestry.com. New Orleans, Louisiana Marriage Records Index, 1831-1964 [database online]. Provo, UT: MyFamily.com, Inc., 2002. ), Vol 18, page 313 (Reliability: 1). [S227] Marriage Certificate, Vincent Fauria and Olympe Fleury (1895), New Orleans, Louisiana, book # 34, folio 261. Photocopy in the collection of Lloyd and Katherine Bennett (Reliability: 3).